Sunshine Beach Accommodation . Costa Nova Apartments. Beach Front Apartments. Sunshine Beach Accommodation. View-Select-Reserve !.....You Choose. Book DIRECT & SAVE $. PLUS you are able to reserve the exact Apartment that suits YOU best ! Your choice. NO Credit Card Fees and NO Booking Fee. 1800 68 2709 for direct bookings. MAY - JUNE 2019 SPECIAL short stay rates, plus longer stays = reduced rates. Please ring for 5 nights plus REDUCED rates. We Guarantee the Best Rates for DIRECT Bookings. Typically an EXTRA 5% + discount from Online Travel Agents (ATO) advertised rates (or greater pending on your length of stay) Sorry - Some conditions and Apartment exclusion do apply. SHARE a huge amazing Level 4 - PENTHOUSE (includes your own 6 person Spa & BBQ) with your friends - twice the space - share the cost. Costa Nova Noosa Resort is Nestled quietly out of the way of the hustle bustle of Hasting street, yet still in the middle of everything you need to have a fantastic beach front holiday in our lovely Sunshine Beach village/area. Balconies with SUN LOUNGE , Table and Chairs, plus room to move. PILLOW Top/memory foam mattresses in ALL of our Apartments - for that lovely sleep. SMART TVs . bring your Netflix/Stan etc streaming account login and enjoy unlimited free DATA Movie Streaming. (available in 85% of the Apartments - see individual Apartment descriptions) Plus free Foxtel Movie/Sport/Discovery etc channels. NBN+Latest WiFi Internet Wireless mesh System within every Apartment. Complimentary Wireless Internet (T&C apply). Wide Ocean Views. No roof tops in front of your self chosen apartment. BIG Apartments and Penthouses - Floor Plans of every Apartment/Penthouses. All Apartments with Nespresso - Capsule Coffee machines. Great Ocean Views from Every Front Main Bedroom, Lounge, Dining area and Kitchens !! Patrolled Surf beach (generally right in front). Beach access either end of our building, plus our Heated Pool & Spa all year round. Electronic Lock Security system thoughout the building. RFID locks. Easy Entry: Direct access via our NEW LIFT (from our carpark) to most Apartments - some with 1 Level of stairs required (except Penthouse 16 - 3 levels - but its well worth it !). OUR BEAUTIFUL BEACH RIGHT IN FRONT. EASY ACCESS, Kilometres of unsurpassed white, sandy beacheCs is what will greet you as you approach Sunshine Beach along the David Low Way - the main arterial road link to Noosa Heads. Sunshine Beach Accommodation with clear views. NO ROOF TOPS ! , Sunshine Beach - Noosa's best kept secret - experience COSTA NOVA! Affordable, Luxurious Self catering holiday accommodation with unsurpassed Spectacular Wide Ocean views from every Beachfront Apartment. Praised as the best Accommodation / Location at lovely Sunshine Beach - Noosa Region. Over 4 Levels. 18 Apartments . ALL AIR CONDITIONED. PLUS - GREAT WIDE OCEAN VIEWS. LEVEL 1, One Apartment, # 2 with a 19 mtr ! Front balcony and Ocean Views. Deluxe/Superior.... Spectacular renovation ! 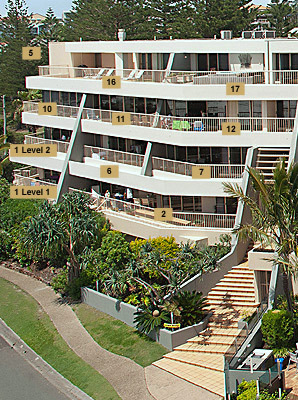 LEVEL 2, 6 Apartments with Ocean & Sand Views (Inc two big Apts over Levels 1&2) we call Deluxe ( 2 bedroom). LEVEL 3, 6 Apartments with Big Ocean & Sand Views . Five we call Premium. (Apt 12 is a 3 bedroom). Plus the Apartment #10 Premium /Superior . Extra Large and just Beautiful. LEVEL 4, 3 BIG Penthouses with HUGE Ocean, Beach & Coast line Views..
AND you are able to choose the exact Apartment for your stay (pending availability). Book early to avoid disappointment !. The perfect spot - Quiet Luxurious Accommodation - lovely Sunshine Beach . Fantastic Ocean Views from EVERY Apartment - including Main Bedrooms, Lounge, Dining Area & Kitchens.!! (some also with second Bedroom water views !).. Good size Front Balconies (some huge) with Sun-Lounge and Table&Chairs - to just lie down and rest in the warm sun. Clear Balconies - NO Air Conditioning Systems on our Front Balconies. Sun Lounge & Table/Chairs on Front Balconies. EASY Apartment ACCESS . FREE INTERNET Wireless - HIGH SPEED internet broadband / NBN across multiple devices simultaneously. Tablet, Smart phone, Laptop friendly system. Complimentary ..Wireless Mesh WiFi - generous daily Data allowance . The latest / best system. Walk between apartments, laze by the Pool - full coverage. Smart TVs in 80% of all Apartments - unlimited movie streaming (BYO Netflix/Stan account details) plus Fox Movies/Sport etc. Heated Pool & Spa, --- Beautiful Winter sun till 3.00 pm . Twin BBQs with sail cover. Kilometres of unspoiled golden sand bounded by the magnificent Noosa National Park with its abundant wild life, flora and walking trails. 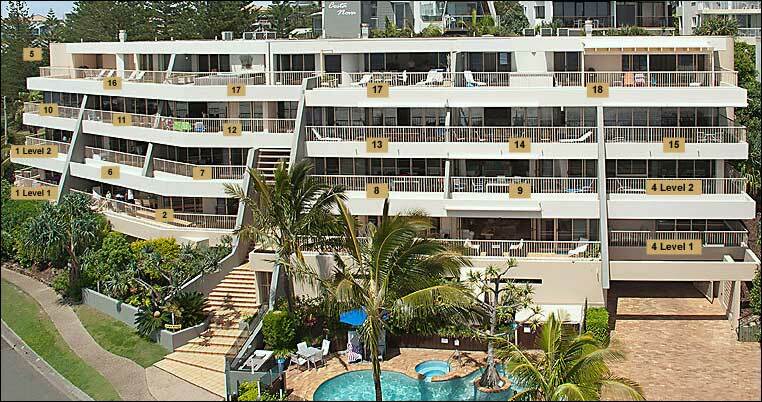 Sunshine Beach Accommodation - Costa Nova, boasts one of the most spectacular beaches on Australia's eastern seaboard. Just to the rear of Costa Nova Holiday Apartments is the Sunshine Beach Village/Duke St village area. The village has 7 great Restaurants, 3 Cafes, a Bakery, a Mini-mart, a Deli, 2 Hairdresser's, 2 Wine bars, 2 Liquor outlets, Take-away Seafood (fish&chips etc) and speciality local Coffee shop "COSTA NOOSA" that roasts its own beans daily. Sunshine Beach - directly in front - patrolled 365 days a year. Patrolled/Flagged area DIRECTLY in front of COSTA NOVA. The Surf Club (Sunshine Beach SLS ) with its own restaurant is open to everyone for lunch and dinner seven days a week- plus a great Breakfast at weekends. 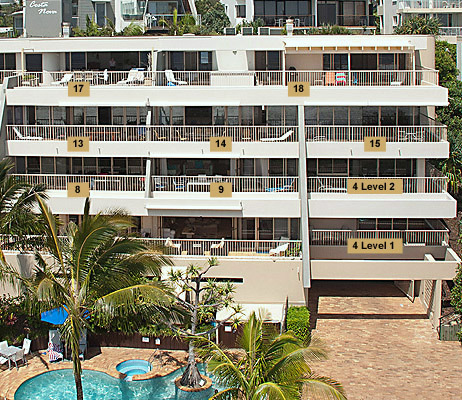 Costa Nova's Beach Front Holiday Apartments are the most spacious and stylishly appointed 2 and 3 bedroom apartments - fully self contained apartments - offering spectacular wide views..........The best of Sunshine Beach Accommodation. Digital Flat Screen TVs in all the Lounges (Receiving HD when broadcast) Digital Free to Air channels plus 15 Satelite channels . Most Lounges with Bluray Players. Our Huge Maxi Penthouses provide unparalleled views of kilometres of pristine coastline from their enormous outdoor sun terraces, plus your own private 6 person spectacular SPA and barbecue. Free Secure Internal carparks (1 per Apartment - 2 per Penthouse), Free storage lockers for every Apartment, plus 6 dedicated visitor on-site carparking spots. HIRE ITEMS AVAILABLE : Porta-Cot, High Chairs, Strollers etc. (free kids beach buckets/spades and kids body boards). For the comfort of all our guests we have a NO PARTY / NO FUNCTION Policy within all our very large Apartments & Penthouses. Very Sorry - Pets are not permitted. Costa Nova ----- Noosa Region. Sunshine Beach Village - Part of the Noosa Experience. Copyright © 2019 Costa Nova Apartments. All rights reserved.